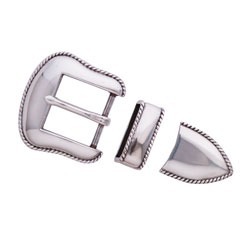 Antiqued Silver Plated Smooth with Rope Edge - Three Piece Buckle Set. Silver plated and lightly antiqued to enhance details in the design. . Notify me of updates to BS-11679-01 Buckle Set Antiqued Silver Plate 1-1/2"